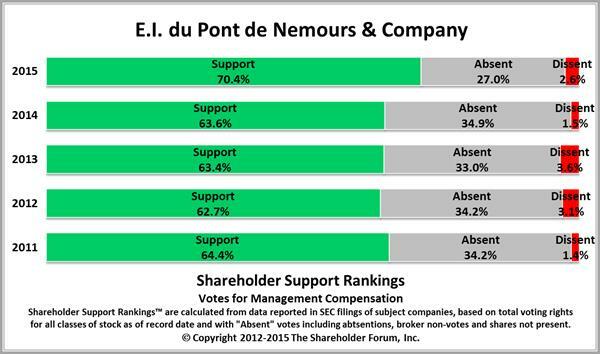 The following graph, based on preliminary voting results for DuPont's 2015 annual meeting, as reported by the company in a May 19, 2015 SEC Form 8K Current Report, illustrates the effects of soliciting normally "absent" retail votes addressed in the article below. 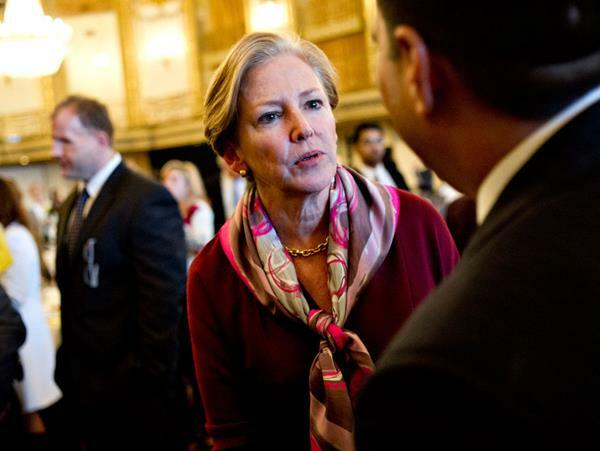 Ellen Kullman, chairman and chief executive officer of DuPont Co.
After pulling off the rare defeat of an activist investor, DuPont Co. Chief Executive Officer Ellen Kullman has emerged as the new corporate champion of the value of long-term research over short-term profits. DuPont shareholders last week rejected Nelson Peltz’s bid to join the board with a view to splitting up the 212-year-old chemical maker and slashing costs. His loss was far from certain: Dissidents prevail in most U.S. proxy battles, and Peltz’s firm hadn’t failed since it was founded a decade ago. In fact, most settle challenges, according to FactSet data, to avoid the scrutiny and distractions that come with proxy fights. And shareholder activists have rarely been busier. DuPont rival Dow Chemical Co. gave board seats to Dan Loeb’s Third Point LLC in November, billionaire Carl Icahn recently pushed EBay Inc. to spin off its PayPal unit and Apple Inc. bought back shares after pressure from Icahn and others. When Kullman, also DuPont’s chairman, and the 11 other directors were re-elected, it was her victory. She and the company’s chief financial officer, Nick Fanandakis, crisscrossed the country, meeting with the top 50 investors. And she took her message to individual investors who constitute about one-third of shareholders, many of them retirees who often don’t bother to cast ballots. That may have delivered the margin in what both sides say was a close vote. Her push-back against Peltz’s break-up argument was that the integration of various businesses -- from crop seeds to auto plastics -- is key to DuPont’s success. Dismantling the company would weaken the research-and-development engine, the source of DuPont’s future sales. Kullman deserves credit for standing up for the research program, said Arnold Holtzman, a retired DuPont scientist. He said having access to fundamental research was crucial in his work, which included developing the tiny balloons used to open arteries in coronary angioplasty. After months of criticism, Peltz’s Trian Fund Management nominated four directors for DuPont in January. Kullman made it clear in February she wasn’t going to settle because she wouldn’t accede to Peltz’s insistence he join the board. The fight went to the wire. Trian employed 175 people on its campaign, while DuPont had 200 making phone calls, mailing information and running websites. DuPont was 0.2 percent higher at $70.80 at 11:04 a.m. in New York. It’s down 5.4 percent since Trian’s defeat. Even as she rejected Trian’s call for steep cost cuts and a split, Kullman was making changes to DuPont’s portfolio, selling the auto-paint unit and moving ahead with the spinoff of the commodity-chemicals segment. Shedding those assets will leave DuPont to focus on businesses with steadier earnings, such as agriculture and food ingredients. Kevin Walkush, a fund manager who helps manage $6.7 billion at Jensen Investment Management Inc., said Kullman and her team visited his Oregon offices in February. She helped convince him that Trian’s plan to boost the share price could have “hobbled the company” longer term. “The strength of her as the leader through this process really came through,” Walkush said. Jensen voted its 1.87 million shares for the DuPont incumbents.